Does the name Henry Standing Bear ring a bell or a monument with you? He is the Lakota man who has commissioned a memorial to Crazy Horse, an Oglala Lakota warrior, in response to the need for a hero for the Native Americans. The project began back in 1929 when Henry Standing Bear (HSB) initiated the project by contacting the sculptor Korczak Ziolkowski, who had worked on Mount Rushmore with Gutzon Borglum. 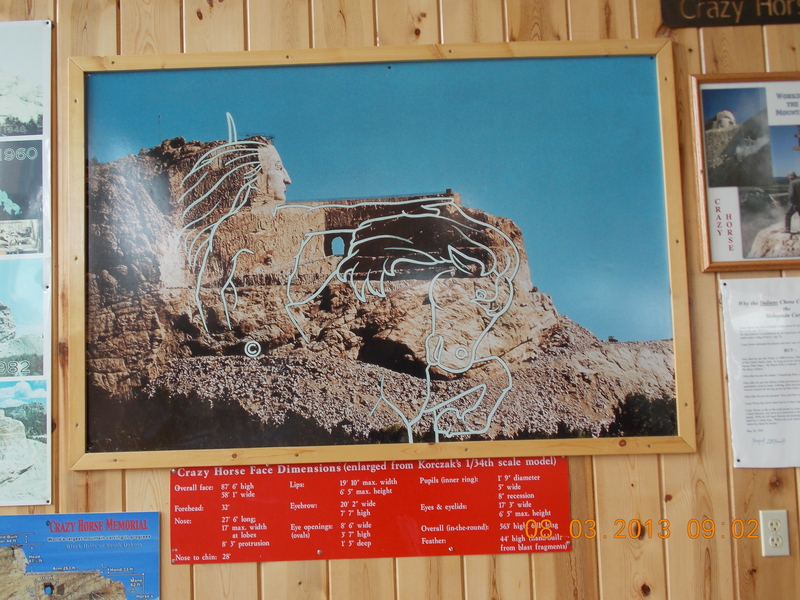 The Sioux elder insisted that the Memorial be carved in the Black Hills, sacred to the Lakota. It is only 17 miles from Mount Rushmore. The actual construction began back in 1948, and is far from completion. 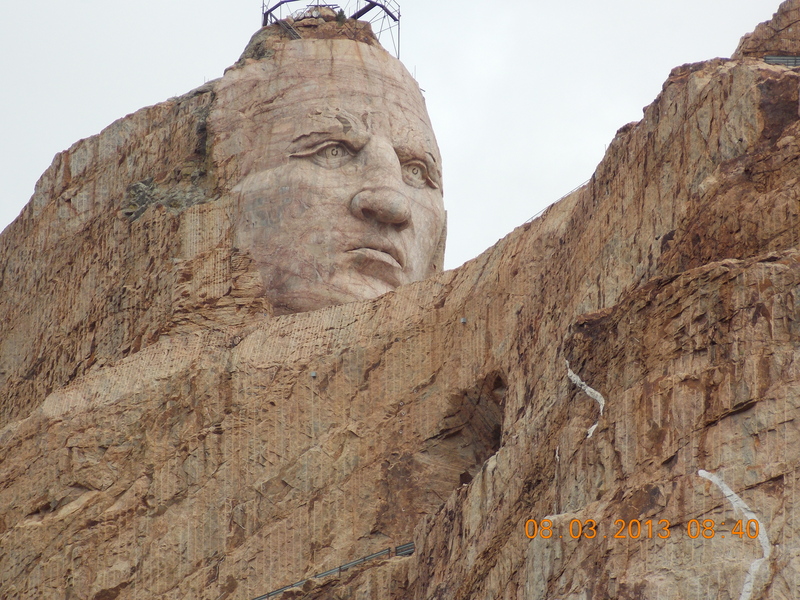 The head of Crazy Horse will be 87 feet high, compared to the four Presidents at Mount Rushmore at only 60 feet high. When completed, it could be the world’s largest sculpture at 563 feet high and 641 feet long. This is also the fifth granite face to live in the Black Hills. The Memorial receives no public funding, being entirely non-profit. The sculptor, Korczak Ziolkowski, was twice offered $10 million by the Federal government, but turned it down, fearful of government involvement. 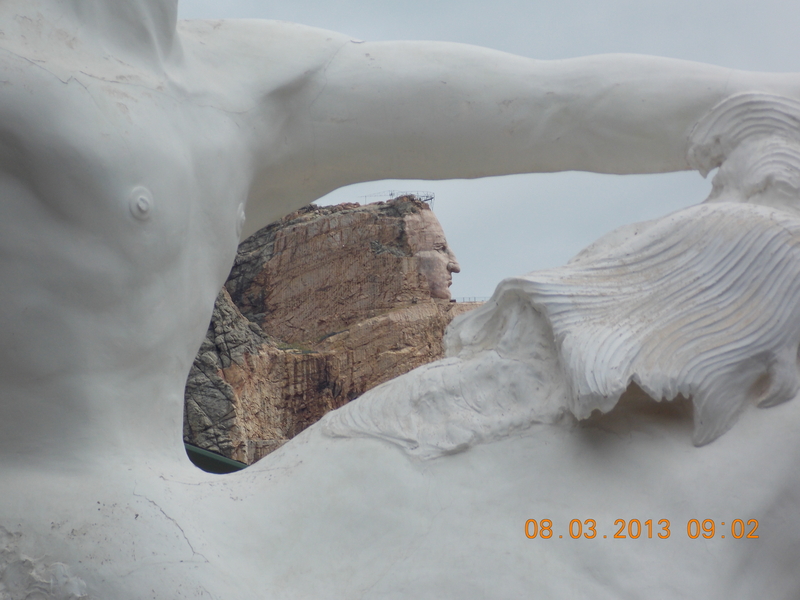 Though he died in 1982, the face of Crazy Horse was completed and dedicated in 1998. His family carries on the work, using three books of his quite detailed plans. Crazy Horse himself had an aversion to being photographed, and was deliberately buried where his grave could not be found. There is controversy that Standing Bear should not have independently hired Ziolkowski to create the Memorial. The lack of consensus and the infringement upon their sacred lands translated to a lack of respect for the people and the culture. Perhaps on a larger scale, the fact that the sculpture has focused interest on a great man and his people should not be discounted. In a country as diverse as ours, as the demographic landscape changes so quickly, perhaps the Native Americans will feel better about this Memorial. Equally important, did you know there are nine tribes making up the three dialects of South Dakota? They are the Dakota, Lakota, and Nakota. They number about 62,000 , and they do welcome visitors into their tribal communities. But some communities prohibit photo taking, sketching or video recording. Sites for devotions or offerings are not to be disturbed. Above all, do not pick up any artifacts, as the land is protected under the Native American Graves Protection and Repatriation Act. My question is this? Are not both the Alaskan Eskimos and the native Hawaiians equally native Americans? Have they received land, amnesty, or special benefits? Just asking. This was an inspiring visit. The dedication of the Ziolkowski family is impressive. I urge you to visit, or at a minimum, go online and make a donation for this worthy endeavour. ← Broken Spoke or Buffalo Chip? Hey! Someone in my Facebook group shared this website with us so I came to look it over. I’m definitely loving the information. I’m book-marking and will be tweeting this to my followers! Exceptional blog and brilliant style and design.